Charming, historic Ferryman's Cottage (circa 1844) is built of heart totara and matai, and stands on a large, private section opposite vineyards and five minutes walk from Martinborough Square. It has a charming bathroom (claw foot bath), two bedrooms (one queen, one king single twin) and a fold-out sofa in the lounge, so can sleep six. 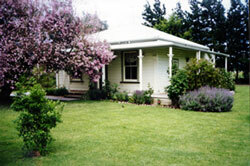 It is fully self-contained with all linen, crockery and utensils, and breakfast provisions are included.